The articles that follow provide a snapshot of some of the fascinating, perplexing, joyous, and intense subjects I’ve gotten to cover as a full-time reporter for the Yellow Springs News and as a freelancer for various newspapers in Ohio and El Paso, Texas. My foray into nonfiction can directly be traced to reading Paul Theroux’s Pillars of Hercules, a hefty piece of travel writing that chronicles the notoriously cranky author’s journey across every country that touches the Mediterranean. The notion that someone could travel and simply write about the stuff he sees was astounding to me, as I was living in Spain at the time and certainly fancied myself a cool, intellectual traveler. My first pieces of nonfiction were bits of travel writing that essentially copied what I thought Theroux was doing; as such, they were not very good because I didn’t quite get that such writing had to be more than just describing the people and places I saw. Nevertheless, the feeling of being immersed firsthand in the subjects you wrote about really appealed to me, and I began to read longform nonfiction (of which I’d always been a fan) with a much more perceptive eye. I wrote a piece about my hometown, Zanesville, Ohio, that apes Gay Talese’s New York: a Serendipeter’s Journey, and I found that I really liked doing research and making phone calls and compiling all of this information into (what were hopefully) engaging articles. Upon my return to the US, I found that UWeekly, in Columbus, Ohio, was looking for freelancers. Bolstered by the high opinion I had of my ex-pat self, I figured that I could pen some articles for them with relative ease. The editor took me under his wing and gave me the green light to write about things that really appealed to me, such as hidden maintenance tunnels, street preachers with outrageous points of view, and the times that OSU’s then-president made culturally insensitive remarks. My abilities and interest were taken to the next level when I was offered the opportunity to cover the appearance of the notorious Phelps family on OSU’s campus. This family is the cult that demonstrates at soldier’s funerals on behalf of their vengeful, homophobic gold, and while I found their worldview completely abhorrent, I immediately jumped at the chance to ride around with them in their van prior to their demonstration. The experience was incredible, the article turned out well, and I decided I wanted to do this kind of thing as often as possible. Influenced by heavy reading of the New Yorker and narrative nonfiction books on dozens of topics, I attempted some self-directed articles, some of which turned out well and some of which were, lets say, terrible. But I kept at it, gradually shed any interest in writing fiction, and found myself applying for a job at the YS News in June, 2015. 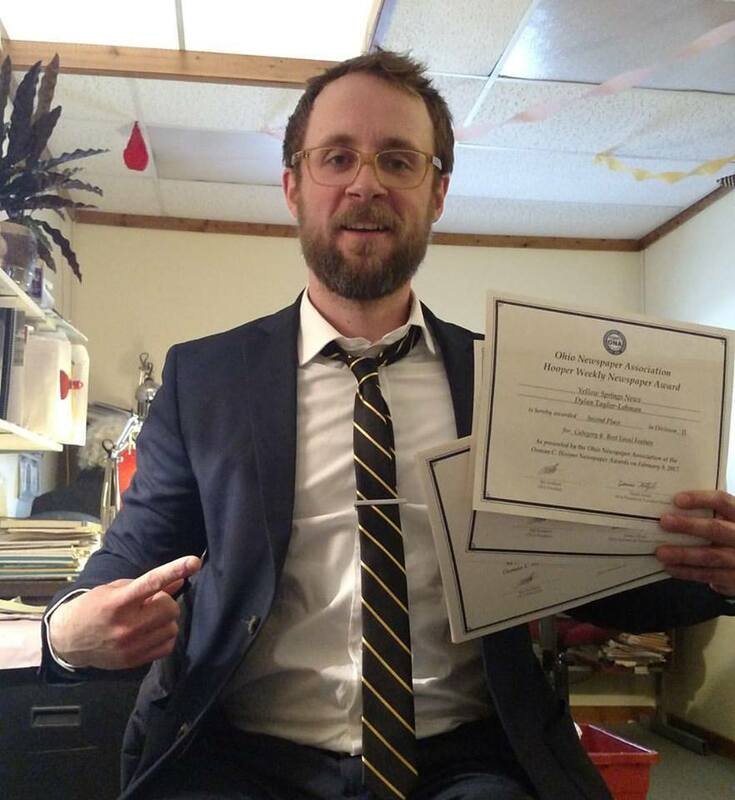 Your dude with a handful of ONA awards, circa Feb. 2017! Someone I had the interview of my life and was offered the job. While a small weekly paper, the News is very well respected and takes itself quite seriously. The staff are all highly intelligent and skilled, and so the position was not just a job but a sort of writer’s graduate school or bootcamp. Being able to work there was an invaluable experience and gave me the chance to try my hand covering all kinds of topics. I wrote a number of feature pieces that were better versions of the kind of thing I had been trying since I began writing nonfiction, and I learned how to cover school board meetings, high school sports, landfills, and art openings, as well as hyper-serious topics like an overhaul of the police department and the first double homicide in the area in more than a century. I could feel myself becoming a better writer, and I knew I’d found my calling when I won five Ohio Newspaper Awards for articles I’d written during my first year there. I was especially proud of a second place finish for an article I wrote about the Rumpke landfill outside of Cincinnati. I eventually moved far west to be with my sweetheart, and I have since been freelancing for El Paso Inc. and its series of publications. Being able to poke around a new city and learn about its history, people, and culture has been fascinating, and I have been able to approach these assignments with confidence and (what I think is) an engaging voice. Nonfiction and journalism is my calling – all I want to write are stories full of adventure and weirdness, and that illuminate aspects of the world that people might not have known about. Thanks to the chances editors have taken me over the years, I’ve gotten to apply my abilities to the stories I want to write and even have a forthcoming book that I am proud to have stand somewhere on the same shelf as the books and authors that inspired me to write this kind of stuff in the first place.